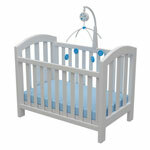 WASHINGTON, D.C. - The U.S. Consumer Product Safety Commission (CPSC) voted unanimously to approve new mandatory standards for full-size and non-full-size baby cribs as mandated by the Consumer Product Safety Improvement Act of 2008 (CPSIA). The federal crib standards had not been updated in nearly 30 years and these new rules are expected to usher in a safer generation of cribs. For most people, apartment living translates into “How do I make the most of the space I have?” Maximizing the vertical space by stacking objects, using tall shelving units and bookcases is one common way. But since children love to climb and get to things out of their reach, be sure all unstable furniture, especially front-heavy furniture (a child’s dresser with all the drawers pulled out simultaneously and leaned on), and lightweight furnishings (i.e. floor lamps) are properly anchored to the wall even if the walls are plaster. Screens keep bugs out, not kids in. Window guards, to prevent children from falling out of windows. Window stops so that windows open no more than four inches. Close and lock windows when they are not being used. Keep furniture away from windows so kids cannot climb to the ledge. If you have double-hung windows —it is generally safer to open the top pane, but growing kids may have enough strength, dexterity and curiosity to open the bottom pane. Be vigilant. Do not rely on window screens to prevent falls. 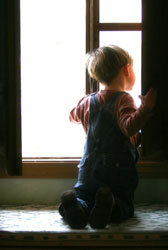 Supervise children at all times, especially around open windows. 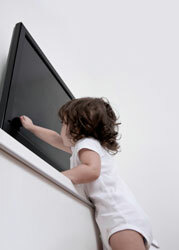 WASHINGTON, D.C. - Many parents and caregivers may not be aware that one of the top hidden hazards in the homes where young children live or visit is unsecured and unstable TVs, furniture and appliances. Today, the U.S. Consumer Product Safety Commission (CPSC) is urging families to take a moment to inspect and secure these items to prevent any more tragedies. Between 2000 and 2008, CPSC staff received reports of nearly 200 tipover related deaths involving children eight years old and younger. Nearly all of these fatalities (93%) involved children five years old and younger. It is the nature of young children to explore the world around them, but their curiosity can lead to serious injury. 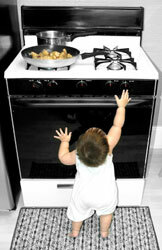 A professional childproofer can help identify safety hazards in your home. Each year there are about two million children under the age of five who are treated in emergency rooms for injuries that occurred in the home. Listed below are some of the most common – and preventable – child safety hazards. Remember, specific hazards vary from home to home and from child to child, so this list is by no means all-inclusive.